Today I had a go at making fudge. It's one of those recipes that people avoid as it's hard to get right. I wish I'd known that before I set out! ha ha. I don't think I got it quite right. Everything seemed to go okay - but the texture isn't very creamy it's more like a sugar mouse. (Which is fine but they are way easier to make, you don't have to boil sugar or anything). These are also VERY VERY sweet. 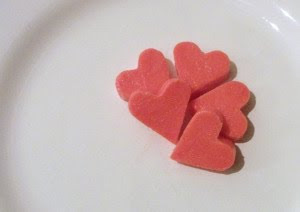 If you'd like to have a go, I got the recipe here: creamy fudge hearts, it's on the Martha Stewart site. I only made half the quantity suggested and I'm glad I did as anymore would have bubbled over the top of the pan! To be fair it does say what size pan you need but I don't really get what a quart is. Anyway, you need a BIG pan, a jam/candy thermometer and lots of patience. The fiancé would like to add at this point that VERY VERY sweet is an understatement. EDIT: They tasted much better the next day! Still sweet but a lot more creamy. As someone who likes crafting all kinds of things I was really taken by this cute paper punch. 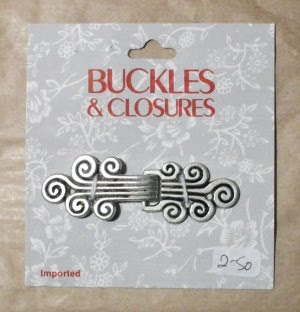 Not only does it cut out little buttons, it embosses them as well! They'd be lovely in a scrapbook or on cards for people who like to sew. It's a Martha Stewart product which I've never seen the UK before. They seem popular though - they are sold out on a lot of craft supply sites. I'll show you the results as soon as I get my hands on one of these little beauties.